This week, Recovery Is Beautiful is highlighting one Ohio community who is partnering to support recovery in their local area with a new “Recovery. It’s Worth the Fight” resource guide! 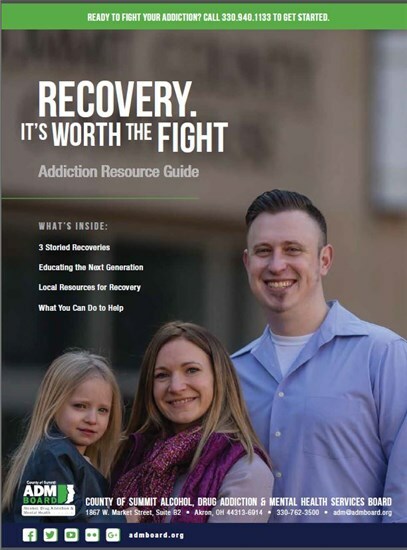 The County of Summit ADM Board, Community Partners, and Akron Life magazine partnered to develop this guide to highlight recovery services and success stories to fight addiction. The ADM Board Addiction Resource Guide is designed to educate readers about the disease of addiction and ways to combat it. Divided into multiple sections, the guide provides detailed information on prevention programs in our schools, safe methods for disposing of unwanted medications, tools for families to start conversations about addiction, and resources for those ready to seek help. The ADM Addiction Hotline is featured as an effective new service to connect people ready to face their addiction with the support and treatment they need. Also included in the guide are inspiring stories of neighbors who have battled addiction and won, shining a light on the hope and possibility of an end to this tragic epidemic. To see more, click here.